The first reading today is very long but it is a great story of deceit and wickedness which is shown for what it is by Daniel. As in most great stories of the kind it is about lust and desire, two older men lusting after a beautiful young woman. But God intervenes and protects the innocent through his prophet Daniel. The two men are found to be lying and are put to death. 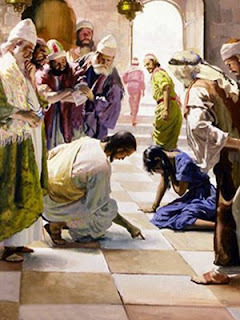 In the gospel we have the story of the woman caught in the ‘very act of adultery.’ Somehow, and we are not told how, Jesus confronts her accusers with their own sins. But when he has shone his light on the hearts of these bitter men who are trying to find a reason to put both the woman and Jesus to death, they all walk away with their heads bent in shame. The two stories are about the protection of the innocent and God’s forgiveness. They are also good illustrations of the deviousness of man’s heart and the way that seemingly good people are as capable of evil intentions as anyone else.